Successfully Added Wireless Fish Finder - Sonar Technology, Wireless Sensor, 90-Degree Beam, Adjustable Depth And Sensitivity, Back Light Display to your Shopping Cart. Never again return empty-handed from your fishing trips thanks to this portable fish finder. By using sonar technology, this fishing gadget is capable of finding any fish that is trying to hide in your area. You will be treated with detailed information on the fishes’ size and location. Additionally, your fish finder will tell you about the current depth on which each fish is located. It comes with a wireless sensor that features a 100m range. This brings along great efficiency and mobility. From now on, not a single fish in your area will stay unnoticed. This sonar fish finder is suitable for any type of fishing. It can be used in temperatures ranged from -10C to +70C meaning that you’ll even be able to carry it along on your upcoming ice-fishing trips. By using its sonar technology, you’ll be able to spot fishes up to a depth of 36M. Your sensor features 10 different levels of sensitivity thanks to which you can easily adjust it to find the exact fish that you’re looking for. The depth range is furthermore adjustable and comes with 6 different settings. This brings along great usability and ensures that you’ll only find the right fish at the right location. The sensor has a 90-degree angle thanks to which not a single movement under the water stays unnoticed. The fish finder features a compact design and can be easily carried around during your upcoming trips. It packs a 1000mAh battery that supports up to 5h of continuous usage time. This is enough to get you through a joy filled day out in nature. 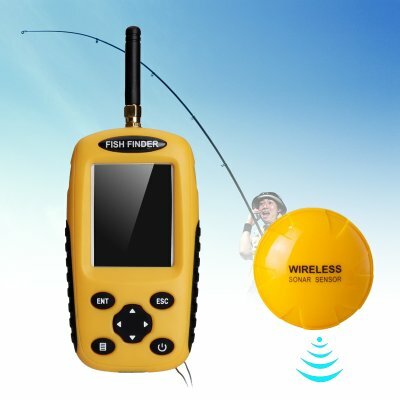 With its fish alarm, your portable fish finder will instantly inform you whenever a fish is detected in the area. Additionally, it also features a depth alarm to make sure that you’ll always have your fishing equipment adjusted accordingly. On its LED display, you’ll be constantly informed about the number of fish in the area, their size, and depth. It will furthermore inform you about the water’s temperature and the bottom contour. With its LED back-lit feature, you’ll be able to use this fishing gadget at both day and night. This fish finder comes with a 12 months warranty, brought to you by the leader in electronic devices as well as wholesale electronic gadgets..
Water bottom contours and structure are showed in the middle as well as water depth, fish size, and location, etc.